Patrol the skies and roam the streets as your favorite superhero this Halloween. Find a great selection of superhero costumes to choose from in this assortment of Halloween costumes. Transform yourself into almost any superhero from the DC or Marvel comic book universe when you choose a costume from this collection. 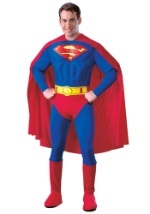 Defeat evil-doers and protect the public with one of these superhero costumes this Halloween.